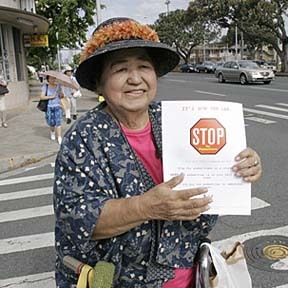 Holding a "stop" leaflet, Yoshiko Arakaki crossed a busy King Street area crosswalk yesterday. Police officers, emergency workers and others, including Lt. Gov. James "Duke" Aiona, passed out fliers as part of the Walk Wise Hawaii program to make people more aware of pedestrian safety.